TOKYO, JAPAN--(Marketwired - January 30, 2017) - Juniper Networks (NYSE: JNPR), an industry leader in automated, scalable and secure networks, today announced that Tokyo Stock Exchange, Inc. (TSE) has chosen the Juniper Networks® MX480 3D Universal Edge Router for an extensive upgrade of 'arrownet v2', the network platform responsible for its proprietary trading system 'arrowhead'. As one of the world's top stock exchanges and the largest in Asia, building and maintaining a cutting-edge network featuring world-class reliability and performance has always been key for TSE. As technology evolves alongside rapidly changing customer needs, TSE required an upgraded, innovative network infrastructure with the ability to integrate across all financial trading in Japan, which Juniper is able to provide. In addition to having connectivity to the Tokyo Financial Exchange (TFX), the Japan Securities Depository Center (JASDEC) and the Tokyo Commodity Exchange (TOCOM), TSE placed priority on increasing network speed, reliability and scalability, while also embedding security throughout the network, a requirement for powering Japan's advanced economic infrastructure. TSE has selected the Juniper Networks® MX480 3D Universal Edge Router as the network device best-placed to meet these criteria for 'arrownet v2', the network platform responsible for its proprietary trading system 'arrowhead'. Previously, 'arrownet' users required separate network connections based on factors such as the environment (production or test) and distribution method (unicast or multicast), resulting in higher networking costs. 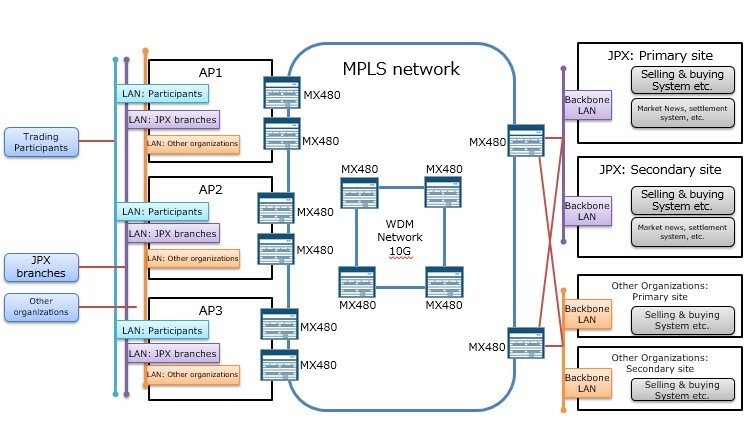 With the MX480, TSE can now leverage Multiprotocol Label Switching (MPLS) to deliver multiple services over the same network, which increases network efficiency, reduces latency and provides significant cost savings. The MX480 also delivers significant scale and performance improvements, including a 50 percent increase in TSE access points and 10Gbps network service delivery to its users. With support for 40GbE and 100GbE interfaces and system capacity that scales beyond 2.8Tbps, the MX480 provides a future-proof path to meet the continued growth of 'arrownet v2'. The MX480 and other previously-deployed Juniper network elements all run the Junos® operating system, which provides TSE with network-wide operational and feature consistency. "World-class performance, reliability and stability is crucial for our daily operations at the Tokyo Stock Exchange, and we are delighted to have been able to rely on the consistent technology and services from Juniper Networks through the years, having had zero major incidents since 'arrownet' was first established in 2009. Alongside Juniper, we look forward towards continued support of the Japanese economy, as we build up the networking infrastructure to support those goals." - Ryusuke Yokoyama, Executive Officer, IT development, IT Services, Tokyo Stock Exchange, Inc.
"We are excited to continue our long-term track record of providing networking infrastructure excellence alongside Tokyo Stock Exchange as we help upgrade and future-proof 'arrownet v2'. Tokyo Stock Exchange is a vital player in the world's financial services industry and economy, and we are delighted to have been selected once more as a trusted partner in their on-going success." Juniper Networks, the Juniper Networks logo, and Junos are registered trademarks of Juniper Networks, Inc. and/or its affiliates in the United States and other countries. Other names may be trademarks of their respective owners.